Acquisition History: These WMAs were acquired using Federal Aid in Sport Fish and Wildlife Restoration funds. Lamontagne WMA was acquired by the NH Fish and Game Department in 1981, Woodman Marsh in 1971, Dole's Marsh in 1970, and Straughan in 1985. 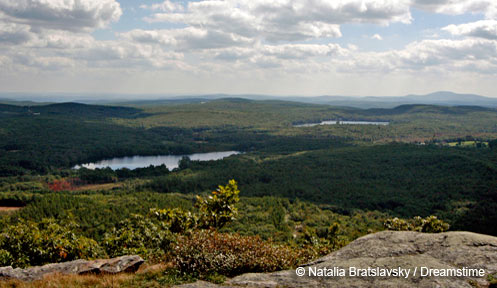 Description: Lamontagne WMA consists of 337 acres of wooded upland with beaver flowages scattered throughout. It has stands of white pine and hemlock, and mixed hardwood stands of oak, beech, and maple. There is also a small opening with old apple trees at the site of an old camp. Dole's Marsh consists of a 25-acre waterfowl impoundment bordered by mixed hardwood/softwood forest. The 74-acre Woodman WMA includes a 10-acre waterfowl impoundment bordered by white pines. Woodman WMA also has an old apple orchard and forests with white pine, hemlock and mixed hardwoods. The 42-acre Straughan property consists of mixed wood including red oak, white pine, red maple, and a significant amount of hemlock. Mr. Straughan lived on the property until 2003. He maintained a Christmas tree plantation, orchard, garden and yard area near the site of his home. Common Wildlife: A variety of waterfowl species occur including wood ducks, mallards, and black ducks. There are beaver, moose, white-tailed deer, black bear, snowshoe hare, ruffed grouse and woodcock. Special Notes: Dole's Marsh WMA abuts the 138-acre Woodman State Forest. This property is managed cooperatively by the Department of Resources and Economic Development and Fish and Game to enhance wildlife habitat for waterfowl and upland species. Access to Lamontagne WMA is along a woods road across private property. In 1986 crabapples were planted by the NH Wild Turkey Federation in the opening near the camp, then released from encroachment in 1997. A wildlife habitat improvement project and timber harvest was completed in 1998 at Lamontagne WMA, with the prime objective of regenerating red oak for hard mast production. Directions: To get to Lamontagne WMA, from Route 4 in Northwood turn on to Route 43 and proceed 1.5 miles to Lower Deerfield Road on the left. Then proceed 1 mile to Northwood-Deerfield town line and the parking area at Woodman Marsh. Walk-in access to Lamontagne WMA is located to the east past the gate with the WMA .5 miles beyond the gate along the woods road. To get to Dole's Marsh, take Route 43 in Northwood for 2.6 miles, the marsh will be on the left side of the road. There is a parking area for 6 to 8 vehicles at the dam site. Canoe access is available at the damsites for both Dole's and Woodman marshes.